L.A.'s Disney Hall Shines -- A Bit Too Brightly Since its opening in 2003, the Walt Disney Concert Hall in downtown Los Angeles has been a big success. But it turns out part of the of the shiny metal building is making its neighbors squint. Workers are busy sanding the metal to dull the gloss. 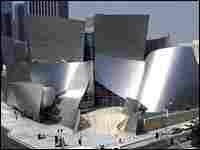 Since its opening in 2003, the Walt Disney Concert Hall in downtown Los Angeles has been a big success. Concerts have been selling out, and many critics have swooned over architect Frank Gehry's design. But it turns out part of the shiny metal building is actually too shiny. The problems became apparent early on. Drivers were blinded by the glare, and residents of the condos across the street complained about the reflected heat. Initially, a gray tarp was hung over the worst area, which makes only a small percentage of the building. Now workers are sanding down the metal to dull the gloss. Gehry says he was recently in Hong Kong when someone asked him about the glare, but he says too much is being made of the problem. "It's not a story that should be all around the world like it is. So I don't know why you guys are even talking about it."